Today we have a football acca and an interesting observation from Peter Hawkeye that might find us some winners at Chester. First don't forget to make your Sky Super 6 entry for an absolutely free chance to win a quarter million pounds. We've got a football perm from The Alternative Punters Syndicate again, these bets havent hit form yet, but last year we had a fair few collections around the £100 mark from £1 per bet stakes. I always find it interesting when Irish trainers make the trip over to the UK mainland for certain middle of the road kind of meetings and with horses that seem not to have been in the best form over in Ireland. Today I noticed that John Patrick Shanahan has a few runners at Chester, a course he has done well at before. So it may pay to take a close look at those runners and hopefully one or two can pop up at decent prices. Today we have football bets from The Alternative Punters Syndicate and racing thoughts from Peter Hawkeye. We'll start off with football. You can trial the TAPS racing and football service for a full month for free here. This will return just under £110 for £1 stakes. Trial the Hawkeye Tips service for one month for just £7.99. The draw at Chester is always to the fore when any race takes place there. But sometimes this is overplayed from the bookies, because they just think anything drawn wide must be at a big disadvantage. This is not always the case, because if a horses race style is to be held up then a draw can have little impact on that horses overall chance. Yes you will still need the breaks to run through the field, but that would be the same in any race with any draw. The only difference being that the tight nature of Chester could make this a little more tricky. I do think today Angelito in the 4.45 at the venue is a case in point and as such the 12’1 with a few bookies looks generous. Today I'm going to have a little catch up on some of the angles we've looked at recently. Starting off with September Trainers. You'll remember on the 3rd of this month we published a list of trainers to follow in September. After 11 days we have had 20 bets, 3 wins and a profit at industry SP of 1.5 points. 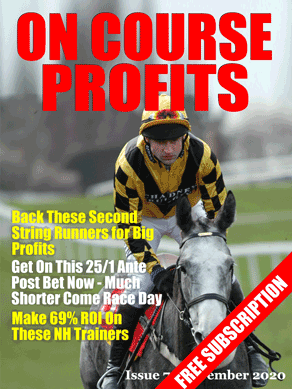 The Betfair SP profit is a slightly juicier 4.55 after commission which is a 22% ROI. Mark Foley's Gordon Elliott angle got of to a cracking start with a 7/1 winner on the day we published and 3 winners from 4 on the second day. My stats may have steered readers away from the odds on selections but either way great profit was made and this is one to follow going forward. The next Perth meeting is on the 24th and 25th of September. Finally it is Chester tomorrow and although the low draws will be bet in the sprints you'll remember that our previous articles have shown that horses drawn 1 and 2 have a definite advantage on the 11 and 12 furlong races also. This advantage is overlooked or not known by the majority of punters and is a source of value bets for us.